Hello everyone! I thought I would chime in about my learning experience so far with Colemak and join in with others who appreciate it. It's a pleasure to meet you all, and you're welcome to call me "James" if you like that better than this ancient username. Upon learning of Colemak's existence, I had been a QWERTY typist for some 14 years. It wasn't so terrible, I thought, and flying at around 100 WPM on average was nothing of which to be ashamed. It wasn't until I had the ability to construct my own keyboard from scratch that the thought of a more efficient layout even dawned on me, and down the rabbit hole I went, starting with embracing an ortholinear layout and a non-standard arrangement of keys. I tried a lot of tweaks and personal changes to Colemak and Workman (thinking that I knew better than their creators what my own needs would be in typing) and finally retreated back to the comfortable, far less desirable QWERTY after a month or so. No matter how much I loved the changes, it was taking too long to commit them to memory, and I wasn't getting nearly enough dedicated practice time. Much of the reason for that hasty retreat came from the fact that there was so much to take in, I wasn't thinking about the practicality. You're not just getting a new layout with Colemak, you're opening the doors to a whole new way of thinking about how you work and how you can make every aspect more efficient, elegant, and enjoyable. While that is wonderful when you have plenty of time, it's not so great when you have to type as part of your job every day. I had to live with feeling like a quitter for awhile. Recently (about two weeks ago), there was a lull in my workload, so I decided to stop messing around with the mere idea of Colemak and commit myself to it. 30 WPM on TypingCat became 40, then 50, and all the way to 70 at one point. Now, much to my surprise, I'm not "thinking in Colemak" very much - I'm doing a lot of it without the need to think. What a rush! 1) You may know your own needs and preferences right now, but remember that you can learn and grow to fit an existing layout. Slight changes in the layout may sound great, but you may not know the rationale for the layout well enough to make useful changes. Worse, you end up as an "island unto yourself" when you have an all-custom layout. If your changes are shared by no one, the resources to help you along are slim. 2) An hour or so of practice after work each day can give you good results if you stick with it. It's far better to give yourself a manageable practice schedule than to practice for hours only once in awhile. 3) The whole paradigm of keyboard entry as we've had it over the years has limitations. As is, traditional keyboards will never duplicate the fastest steno speeds or be without some flaws or quirks, no matter how optimized the layout may be. Don't set the bar at some nebulous vision of "perfect" and expect that, somehow, you will one day find what you're looking for. 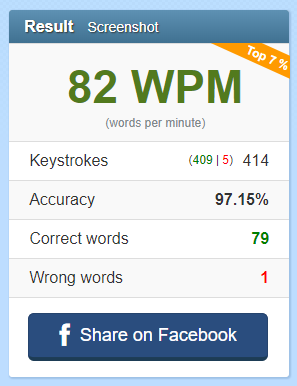 4) 60 WPM is as fast as most people will ever go, and the average speed is usually lower still. Don't be frustrated if that seems to be your upper limit for awhile, even if you're used to typing much faster. It's fast enough to get serious work done and no one will bat an eye at the office. Pretty good advice on the whole! I'd imagine it's easy to get bogged down into making a load of changes (i'm not speaking from experience) but at the end of the day just committing to one, better layout and not touching it will give you a load of practical improvements. I've been a stable Colemak typist for probably two months now, and I remember that learning it was both fun and a drag. It hasn't made me significantly faster (yet) but it has made me loads more comfortable, and that's as close to "perfect" as I need to be right now. I like that Colemak is one, single change that you don't have to keep coming back to, yet it still gives you benefits for all your days as long as you still use it. I've seen those clouds from both sides now. I too started tweaking clumsily about because I felt I could. Then I returned to Colemak proper. But in the 11(!) years since that I've been part of the development and implementation of a whole little family of tweaks so now I don't type vanilla Colemak but Colemak[eD]-CAW+Extend. But the beauty of it is that those tweaks are modular. You can choose one or more if you so wish, and in my opinion it's still Colemak at heart. I very much agree, DreymaR, user enhancements are at their best when others can cater them to their needs, preferably without much re-learning involved. I think where I initially went wrong was in not giving the vanilla layout a chance before deciding what was "wrong" with it. I see things much more clearly now that I'm using an unmodified layout daily. Could it be enhanced? Surely. But the changes would not need to be dramatic. I must say, I've seen your resources and tweaks, and they're definitely worth looking into for everybody. The angle mod even makes me think I don't always have to live in Ortho World, and that's saying something after a year of only using grid layouts! And right you are, NottNott - having Colemak is a huge leap in the right direction even without further modification. I may tinker some more in the future, but that's more out of my own nature than necessity. At any rate, now that I have passable typing speed, I can see no good reason to turn back. Let everyone else work as they may, this has been the most comfortable typing experience I've had to date. Say, DreymaR, I have some news that you'll probably appreciate. I was thinking recently it would be fun to get my hands on an IBM Model M and see if I could bring it into the present day with my favorite firmware (QMK). Since it is as staggered as any other ordinary keyboard, what better a time to try out the angle mod? The result, so far, is a complete and working keyboard that lacks no modern features and has the slightly revised layout hard-coded. I couldn't have asked for a better result, and after an evening of typing on it, I'm convinced that the angle mod was a step in the right direction. It really takes the edge off of the staggering. The only real hurdle in doing this project was the fact that the only QMK effort to do this to date was on a terminal keyboard, and this one is the ordinary PS/2 model and doesn't appear to speak scan code 3 properly. It took an evening to change that around. You know my TMK files I guess. How hard would it be to port them to QMK? I'm guessing not hard... if you know what you're doing...? That way they could reach a wider audience I guess. One nice thing about using the Unimap mapping format is that you can compile for pretty much anything. TMK seems to work properly with PS/2? I've got a PS/2-USB converter up and running with it at least. But I'm no expert on those things. As you see from my topics, my approach to the loud and wonderful world of IBM was to buy a Unicomp model M copy. It's a black beauty for sure. It's not a terribly hard proposition to port to QMK, at least if you have a good base for source code or learn QMK's unique features (which, if you know TMK well, have almost zero learning curve). And it does work well with PS/2, with a few caveats. I suspect that, if I were using a straight scan code 3 setup, many of the issues would disappear, but I couldn't get away with that. Some keycodes simply wouldn't read and couldn't be remapped or used for much of anything.The extended keycodes are also not (yet) accounted for, so there are some instances where I've cheated and thrown a scan code from set 2 that otherwise wouldn't be used into the place of an extended keycode. Some keys you can get away with that, some you can't. Really, there just needs to be some extra logic for handling the extended mapping, and as far as I know, no one has written it. Another important but not especially obvious note is that each scan code can be used exactly once or not at all in the config.h. If you want two keys that do the same thing, that's what a keymap file is for. It is also possible that the relationship between some scan codes will surprise you - for instance, I have been using the numpad for macros, but that makes the arrow keys and the six keys above them perform macros as well. It's funny that IBM made the numpad do a little too much for what I was trying to achieve. One mistake to avoid is, an internal build involving anything more than the Teensy and something to break it out is harder than it looks. While there appears to be copious space in there, even a mini USB cable is a tricky fit. I had to let go of any delusions about getting a larger speaker and some extra switches in there to finish the project in a couple of days (though I may play around with that later). In spite of these mentioned issues, I can confirm that if all you want is a stock arrangement with nothing especially modern or different, that can be done flawlessly with QMK or TMK. And that was setting a comfortable pace. This gives me a bit more hope for the future!